We look at a range of famous math problems, not solved and unsolved. Thanks to Professor Saad El-Zanati from Illinois State University for suggesting this series. Thanks also to Steve Sexton from Exchange for giving permission to use their music track Highlights. You can find more of Exchange's music here. This is the first video of a new series, which will discuss a wide variety of famous (and perhaps not so famous) mathematical problems, ranging from antiquity to modern times. 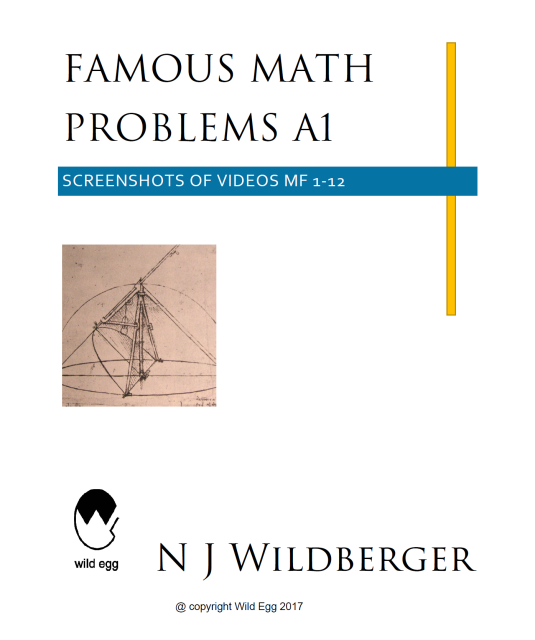 I am N J Wildberger, a pure mathematician at UNSW, the discoverer of Rational Trigonometry and Universal Geometry, and a big fan of YouTube, the future of free on-line education! After introducing the series, we begin with FMP #1: how to factor a particular number z (10 to the 10 to the 10...altogether ten times, plus 23) into primes. We remind viewers about primes and the Fundamental theorem of Arithmetic, and have a look at explicit factorizations related to our basic problem. Then we introduce briefly modular arithmetic and the theorems of Fermat and Euler. This is used to show that 7 does not divide z. Some comments on difficulties with arithmetic with big numbers follows, and then some exercises give some challenges for the viewer. The Collatz conjecture is tantalizing; simple to state, spectacular in its claim, and notorious for defeating all who attack it. First enunciated by Lothar Collatz in 1937, it has also sometimes been called the Syracuse problem, Kakutani's problem, Ulam's problem, the Hailstone conjecture. After stating the conjecture and running through some of the evidence for it, we have a look at some variants, and also some strategies for tackling the problem. One obvious tactic is to look at the problem in base 2; so we first review the fundamentals of arithmetic in base 2. The problem also has a number theoretical aspect. Be warned: this problem is addictive, and you might easily catch the bug! More info on it can be obtained from a survey by J. Lagarias. Around 200 B.C., Apollonius of Perga, the greatest geometer of all time, gave a series of related problems; how to construct a circle in the plane touching three objects, where the objects are either a point (P), a line (L) and or a circle (C). Many mathematicians have studied this most famous of all geometric problems. In this video we give some of the history, discuss Euclid's solution to two of the problems (which predate Apollonius' work), and summarize some circle geometry that is relevant to the subject: the Subtended spreads theorem from Rational Trigonometry, the power of a point wrt a circle, the pole-polar duality determined between points and lines by a circle, and inversion. We also discuss the importance of constructions in both education and theoretical work---a point which has gradually been diminished over the years. Modern mathematics can learn a lot by re-thinking its attitude to the existence of mathematical objects by understanding the clarity that arises from the ancient Greek, and 17th and 18th century insistence on explicit constructions. This problem has aspects which range in difficulty from 1 to 5. It is a great challenge for aspiring geometers. The Graceful Tree Conjecture, or Ringel-Kotzig conjecture, concerns certain labellings of the vertices of a graph G introduced by A. Rosa in 1967. We introduce some basic terminology of graph theory, give examples of graceful and non-graceful graphs, and discuss evidence for the conjecture. Quite a few exercises allow you opportunities for investigating graceful labellings, in particular I take the occasion to introduce the important Coxeter Dynkin diagrams. Today's famous problem is how to expand a power of a binomial, in modern terms how to write out explicitly (a+b)^n when n is a natural number, n=1,2,3,.... This is a familiar topic to all students of mathematics, highlighting its central importance and interest. Omar Khayyam, the Persian mathematician, astronomer, poet and philosopher who lived in Nishapur (in modern Iran, not Iraq as I mistakenly stated in the video!) around 1100 A.D. was probably the first to solve it in general, although the case n=2 was known to the ancient Greeks, and the case n=3 was familiar to the ancient Indian mathematicians, in particular Aryabhata around 500 A.D. A Chinese mathematician Chu Shi Chieh wrote down what we now call Pascal's triangle of Binomial coefficients around 1300. In this video we explain the modern approach to this problem, along with the less well known extension called the Trinomial theorem. We mention a few applications to calculus. And we read a few quatrains from Khayyam's epic poem The Rubaiyat, translated into English from Arabic by Edward Fitzgerald. Archimedes was the greatest mathematician of all time. In this video we give his solution to one of the very first problems in calculus: to calculate the area of a section of a parabola. This requires some understanding of elementary but beautiful properties of a parabola. Newcomb's paradox was first studied by American physicist William Newcomb, and popularized by articles by Robert Nozick and famously Martin Gardner in one of his 1974 Mathematical Games columns in Scientific American. The paradox involves notions of free will, determinism, choice, probability and rationality. So it rests somewhere in the border between mathematics and philosophy. Most people find, on first hearing about it, that there is an ``obvious solution'', however different people have different opinions on what this is--- and the problem has a notorious tendency to change and shift as we contemplate it. In this lecture I will give my own interpretation of what the paradox is actually about, and resolve it! As you might guess, I try to remove all the metaphysics and philosophy, and just deal with the mathematics. For that we will need a brief excursion into probability theory and the notion of expected value. In 1751 Leonhard Euler, the greatest mathematician of modern times, posed the problem of counting the number of ways of triangulating an n-gon. When n=3, this is 1, when n=4, this is 2, when n=5 this is 5, and when n=6 this is 6. The sequence C_n, defined as the number of ways of triangulating an (n+2)-gon, is called the Catalan numbers, and appears in many different guises in combinatorics. In this lecture we derive Euler's formula for C_n, and describe just a few ways in which this fascinating sequence appears, as well as connecting it to Newton's binomial expansion for sqrt(1-4x). How far away from the earth are the sun and moon? This natural and important problem was first successfully tackled by the ancient Greeks, for whom astronomy was one of the most important motivations for developing mathematics. In this lecture we meet the thinking of Thales, Pythagoras, Anaxagoras, Plato, Eudoxus, and most prominently Erastothenes and Aristarchus. These last two gave arguments for computing the sizes of the earth, moon and sun, and the distances to the moon and sun. The lecture is illustrated with diagrams which (roughly) give scale diagrams of our portion of the solar system. The integral of x^n is one of the two most important formulas in calculus. The cases n=0,1 and 2 go back to antiquity, and to Archimedes quadrature of a parabola. The general case was first enunciated by Cavalieri, who gave geometrical arguments for n=3,4,...,9. Subsequently Wallis, Fermat, Roberval and Torricelli gave arguments for the general case. However the problem is not at all completely solved. The issue is with the proper definition of the integral; here many problems of modern analysis emerge, having to do with the nature of the continuum (`real numbers'), infinite processes and limits, ambiguity about a prior theory of areas, and many sensitive technical details which are usually finessed in modern treatments. In this video and the next we outline a new approach to this ancient and important problem, opening the door to an `Algebraic Calculus'. In this continuation of our Famous Math Problem 10, we derive Cavalieri's quadrature formula for polynomials in a new, completely algebraic way, avoiding any use of `real numbers', `infinite processes' and `limits'. The key tool is rather the Binomial theorem, and five basic properties that any reasonable theory of area/integration should satisfy: Linearity, Additivity, Translation Invariance, Scale Invariance and Normalization. Along the way we give brief overviews of different classical approaches to setting up integration theory, such as the Riemann Integral, the Lebesgue Integral and some others. One should be highly suspicious of these theories, which, contrary to popular opinion, have NOT been developed logically and clearly. This is why an algebraic alternative such as we initiate here is so important. In 1826, Jakob Steiner posed and solved the following problem: into how many regions can we divide space with n planes? This video explains his solution. First we look at the analogous but simpler problem: how many regions can we divide a plane with n lines? Euclid's treatise the Elements is easily the greatest mathematical text of all time. Book I lays out basics of planar geometry, with an alternation between theory and practice, where practice means solving explicit construction problems with straight-edge and compass. In this lecture we look at most of these problems, sometimes departing from Euclid's order and presentation, but not from his spirit. These are problems which come up repeatedly when working with modern dynamic geometry packages such as Geometer's Sketchpad, C.a.R., Geogebra, etc.A study of them not only enhances our appreciation for the logical structure of mathematics, but also the importance of constructing mathematical objects before we theorize about them---- a point that is somewhat diminished in the modern formulation of mathematics. W. R. Hamilton in 1846 famously carved the basic multiplicative laws of the four dimensional algebra of quaternions onto a bridge in Dublin during a walk with his wife. This represented a great breakthrough on an important problem he had been wrestling with: how to algebraically represent rotations of 3 dimensional space using some kind of analog of complex numbers for rotations of the plane. This is the first of three lectures on this development, and here we set the stage by introducing complex numbers and explaining some of their natural links with rotations of the plane. There is a lot of information in this lecture, so by all means take it slowly, and break it up by pausing and absorbing the ideas before going further. In particular the last slide (page 9) could easily be stared at for an hour or two. Even old hands at complex analysis may find something novel here to stimulate their thinking, as I insist on a completely logical and rational approach to mathematics--no waffling with angles or ``transcendental notions/functions'' involving ``real numbers''. In fact such a pure algebraic approach is exactly what is needed to set the stage for a good understanding of quaternions. In particular you will learn that the most fundamental fact about complex numbers is properly stated using the notion of quadrance, that turns are a viable substitute for angles, and that the rational parametrization of a circle is intimately linked to a quadratic map at the level of complex numbers. These ideas will prepare us for appreciating the rotation problem in three dimensions, which we tackle in the next lecture, and then the introduction of quaternions, which we explain in the following one. This is the second of three lectures on Hamilton's discovery of quaternions, and here we introduce rotations of three dimensional space and the natural problem of how to describe them effectively and compose them. We discuss the geometry of the sphere, take a detour to talk about composing planar rotations with different centers, talk about the connections between reflections and rotations, and introduce the basic algebraic framework with vectors, the dot product and the cross product. As in the first lecture, there is a lot of information here, so by all means take it slowly, and break it up by pausing and absorbing the ideas before going further. Euler's theorem on the composition of rotations is an important ingredient. You will also learn that a curious addition of spherical vectors on the surface of a sphere provides an effective visual calculus for composing rotations. This lecture prepares us for the next, where we introduce Hamilton's quaternions, which connect the dot product and cross product in a remarkable way, and yield probably the most effective current technique for managing rotations in graphics, video games and rocket science. So yes, this is really rocket science! This is the third lecture on the problem of how to extend the algebraic structure of the complex numbers to deal with rotations in space, and Hamilton's discovery of quaternions, and here we roll up the sleaves and get to work laying out a concise but logically clear framework for this remarkable structure. A main tool that we will use is the algebra of 2x2 matrices, however with (rational) complex number entries. This allows us a simplified way of proving the various laws of arithmetic for quaternions, and brings ideas from linear algebra, like the determinant and the trace of a matrix, into play. We end with an important visual model of quaternions and the key formula that connects them with rotations of three dimensional space. There is a lot in this lecture, so be prepared to go slowly, take it in bite size pieces if necessary, and try your hand at the problems! In the next and final lecture on this topic, we will amplify our understanding of the rotation mapping, and show how quaternions can be practically used to realize rotations and their compositions. All without any use of transcendental notions such as angle, cos or sin-- a big step forward in the conceptual understanding of this subject!! We show how to practically implement the use of quaternions to describe the algebra of rotations of three dimensional space. The key idea is to use the notion of half-turn instead of angle: this is well suited to connect with the lovely algebraic structure of quaternions. The theory of half turns is interesting in its own right, and belongs to what we call Vector Trigonometry--an interesting variant of Rational Trigonometry that we intend to describe in detail elsewhere. Here we only need a few formulas for half turns, which really go back to the ancient Greeks and the rational parametrization of the unit circle which we have discussed many times! By focussing on the formula for quaternion multiplication in terms of scalar and vector parts, we can deduce that any orthonormal set of vectors u,v and w act algebraically just like the familiar unit vectors l,j and k. That allows us to decompose the multiplication of a general quaternion into its action on two perpendicular planes: this is the key to understanding the geometry of quaternion multiplication. It allows us to easily see the effect of multiplying on the left by q and on the right be the conjugate. After a normalization by the quadrance of q, we get a rotation of the vector part of the space, which is the connection with rotations that we seek. Sangaku are Japanese geometry problems which were posted on temple walls in the Edo period. They are often strikingly original to the Western view, with lovely constructions and challenges involving triangles, circles and ellipses. Here we look at one in particular, posed by 13 year old Sato Naosue in 1847, which is not too hard but yields some surprises. Of particular interest is that we look at the problem both from a classical point of view, and also a Rational Trigonometry point of view. The first is pretty straightforward, but the Rational Trigonometry yields some surprisingly complex algebra, which finally yields to shed much additional light on the subject. The full four-fold symmetry between the Incenter of a triangle and its three Excenters (I prefer to call them all Incenters) comes to the fore, and for the 3-4-5 triangle which ends up starring in this problem, a lovely relation emerges between the four Incenter quadrances. Lovely stuff which should provide some motivation for you to go out there and learn some Rational Trigonometry--- the geometry of the 21st century! In this Famous Math Problem, we look at a question that the great Leonard Euler was the first to ask: what is the relation between the number of vertices, edges and faces of a Platonic solid? His resolution of this problem led to one of the most famous, and beautiful, formulas in mathematics; and led to the Euler characteristic which was to have major applications in modern topology. There are five Platonic solids, the tetrahedron, cube, octahedron, icosahedron and dodecahedron. The cube for example has 8 vertices, 12 edges and 6 faces. In this lecture we look a little bit at the history of these objects, discuss Euler's resolution of his problem, and give a modern proof using ideas from planar graph theory. In this lecture we give a novel take on an ancient and important problem that goes back to Archimedes: how to determine the area of a triangle from knowledge of its three sides. For example, if the side lengths are say 7,8 and 9, what is the area? The rational equivalent would be to ask for the area in terms of the three quadrances, which would be 49,64 and 81. Usually Heron's formula is the solution, but it sadly contains unnecessary irrationalities. I present a better solution of the problem, based of course on Rational Trigonometry, which much clarifies the situation. This is based on knowledge of the two most fundamental formulas in mathematics: Pythagoras' theorem and the Triple quad formula. Hopefully this topic can make it back into the high school curriculum, where it definitely belongs! FAMOUS MATH PROBLEMS 17: Are all true mathematical statements provable? Today's Famous Math Problem is usually associated with the work of Kurt Godel, working in the framework of Russell and Whitehead's logistic approach to mathematics. The question is: are there mathematical statements which are true but which cannot be proven? It is not entirely clear what this means: how can something mathematical be deemed to be true if we cannot first give a proof of it? If we treat this as the meta-mathematical question that it is, we can interpret it and give a negative answer without any resort to Godel type arguments. The examples I will give here are completely explicit and convincing: I will show you some mathematical `facts' that are almost certainly true, but for which there are almost certainly not proofs. Other people have made similar observations: I have recently learnt through a viewer of Freeman Dyson's answer in a parallel but different direction, given at www.edge.org/q2005/q05_9.html. Viewers might like to have a look at that too. There is one mathematical problem which is much more important and fundamental, both historically and practically, than any other, and which impinges on almost all areas of pure mathematics. This is the first of four videos on this most fundamental and important problem. In this video we present a basic and profound solution to the most important and fundamental problem in mathematics (which is: How to model the continuum?) This is the rational number line. Our presentation is geometric, assuming a prior theory of affine geometry: this balances the far more familiar arithmetic approach. We briefly outline a view of a more algebraic and logical orientation towards mathematics which rests on the rational number line as the basic continuum. Here is a real alternative to the current set-up of modern mathematics---very briefly sketched. We then discuss a projective view of the rational line, with constructions going back to 19th century mathematicians von Staudt and Hilbert. Basic properties of the rationals are described. Then we discuss the introduction of `irrationalities' via Euclidean geometry and the attempts at solving polynomial equations. Here we discuss important developments re the mathematics of the continuum arising from modern European developments, beginning with the Flemish engineer Simon Stevin who in 1585 introduced essentially the modern idea of a decimal number and arithmetic with them, and then moving on to further issues brought about by the calculus. Stevin's introduction of decimals was very practically oriented, he proposed that decimal number arithmetic was a simpler alternative to arithmetic with fractions. This is a reasonable position, but Stevin's arithmetic was in some important senses more limited than fraction arithmetic-- a point that is still relevant today as we proceed to examine the modern difficulties with `real numbers'. These include the role of infinitesimals: do they really exist, and what are they? as well as the role of complex numbers: do they really exist, and what are they? We meet the idea of an algebraic extension of the rational number line, and also finite variants. In this video we give a bird's eye view of the various misguided attempts at establishing 'real numbers' and sketch some of the logical and technical difficulties that students are usually shielded from. The basic construction arises from Stevin's decimal numbers extended, using a dollop of wishful thinking, to arbitrary infinite decimals, not just the repeating decimals encoded by rational numbers. Understanding the difficulties with this approach is not that hard, and in essence the same kinds of problems resurface in the various variants which we also discuss: infinite sequences of nested intervals of rational numbers, monotonic and bounded sequences of rationals, Cauchy sequences of rationals, equivalence classes of Cauchy sequences, and finally the icing on the cake of irrationality: Dedekind cuts. Students of mathematics! Listen carefully: none of these approaches work. This is the reason why not one of these 'theories' are properly laid out in front of you when you begin work in calculus or even analysis. To those who would try to convince you otherwise, via appeals to authority or numbers, name-calling, or by special pleading on behalf of all those lovely 'results' that supposedly follow from the required beliefs: ask rather for explicit examples and concrete computations. These are the true coin in the realm of mathematics, and will not lead you astray. This is perhaps a place to thank my many contributors, subscribers and online friends. We are on our way to a more beautiful and logically coherent mathematics, but there is a long ways to go from here to there! Your support is a big help.